Animatronics is a cross between animation and electronics. Basically, an animatronic is a mechanized puppet. It may be preprogrammed or remotely controlled. An abbreviated term originally coined by Walt Disney as “Audio-Animatronics” ( used to describe his mechanized characters ) ,can actually be seen in various forms as far back as Leonardo-Da-Vinci’s Automata Lion ,( theoretically built to present lillies to the King of France during one of his Visits ),and has now developed as a career which may require combined talent in Mechanical Engineering , Sculpting / Casting , Control Technologies , Electrical / Electronic , Airbrushing , Radio-Control. Long before digital effects appeared, animatronics were making cinematic history. The scare generated by the Great White coming out of the water in “Jaws” and the tender otherworldliness of “E.T.” were its outcomes. 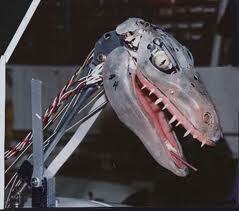 The Jurassic Park series combined digital effects with animatronics. It is possible for us to build our own animatronics by making use of ready-made animatronic kits provided by companies such as Mister Computers.